There are at least 3-4 NBA players on next year’s team. Watford is being projected as a late first rounder in the 2013 draft, Zeller is being projected as a lottery pick (some sites have him in the top 5), Oladipo is steadily climbing draft boards because of his athleticism and defense, Perea has all the physical tools that scouts love and if he can produce and polish his game he is a likely lottery pick (definitely first round). On top of those four guys Hollowell and Ferrell could both make it. If Hollowell continues to score at such a high level there will be a place for him in the league and Ferrell is a high level talent that is being held back by his size more than anything else. Anyone care to speculate of how the oversign will be resolved for next year? The I.U. express is rolling down the track at a high rate of speed. Just ask the Dolly Llama! She sees NCAA Tournament wins for the Hoosiers in the future. I.U. grad class of ’83. I thought the dalai lama was a man? my ideal situation is to not lose any of these players. i think the idea scenario is jurkin going to prep school with roth walking on. jurkin would benefit from one more year to bulk up(hes too skinny for the b1g) and he will sit the bench this year anyway. i also could see hulls dropping his scholly either in addition to jurkin’s prep school (so roth has a scholly) or seperate so jurkin comes. any thoughts on the most likely scenario(which i sadly think is etherington leaving, hes so energetic on the bench) and/or the scenario you would prefer? I saw on Yahoo the other day that someone(sorry can’t remember who) stated that Watford would probably stay feet too slow, can’t handle ball and too many underclassmen and senior applying for the draft. Stated he wouldn’t be a draft pick. Roth is most likely going to be gone, seeing as he gave his senior day speech. I think the best situation would be Jordy giving up his scholarship, but I think asking him to do that is probably unfair. So as much as I hate to say it, I’d say Etherington transfers? 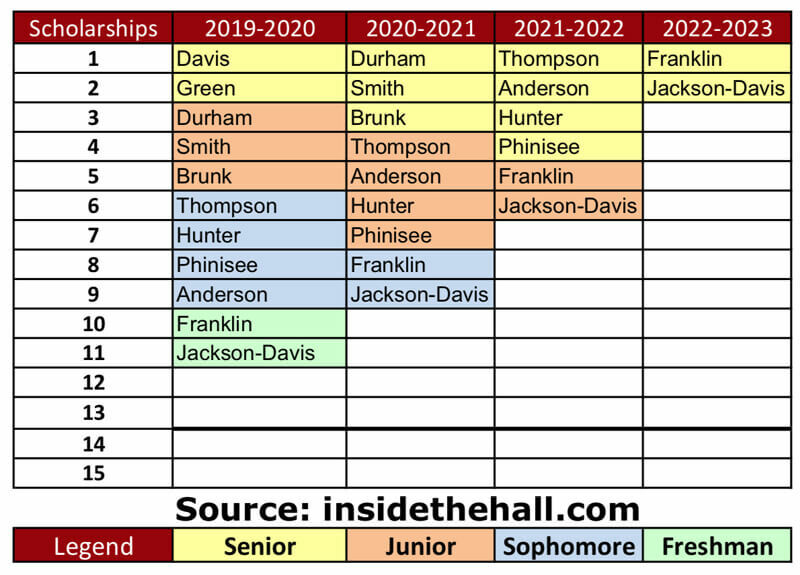 That would open upa scholarship for next season or the season after as well, which we need if we’re gonna sign Anya, Lyle, Alexander, Blueitt, or Russell (all of which I’d be very happy to sign). I guess we’ll see how it plays out. What is Creeks status? Is he playing now, working out, expect to play next season? Is there a way to see scholarship numbers for previous years? Jurkin to prep school still feels like the most realistic solution to me. they have 1 or 2 open[s] in the 12-13 and that might be taken by a returning Creek for a fifth if he’s back. Or maybe Beeja from Demathis takes it, and Creek can walk on. Would like to see Zeller stay for 3 years but he might go after his sophomore season. The obvious choice for redshirt next year would be Etherington. The 15-16 is the big open year, for now. . .
Well now that everybody is staying, wonder what’s going to happen to fit everybody in? I think the most plausible right now is Jurkin going to prep school. It doesn’t really solve the problem seeing as we’re strapped for scholarships in 2013 and 2014, it just kind of postpones the problem. Maybe Crean is anticipating some early NBA entrants. He’s been working out as well as shooting during practices for some time now. During one practice at the NCAA tourney, he participated in all the drills (without protective gear) with the team. He and CTC both say he’s expected to play next season. Anyone think someone tranfers? As much as I don’t want that to happen, what I badly want to see is Peter Jurkin on the floor for the Hoosiers as opposed to going to prep school. I would love to see Watford at the 3 and Zeller at the 4 and the only way that’s going to happen next year is with Jurkin on the floor with them. Even though Cody will not play center at the next level, as efficient on both ends as he was there, I think you keep him there this year as well. Jurkin can go to prep school (remember he was injured and lost almost a year of development I believe) and get stronger, then be a center next year. That way Cody gets to dominate and showcase his skills at forward in year 3 as the best junior in the country. Then on to the NBA with his degree in tow. I thought Creek was red-shirted on medical this year and had two years left??? I believe for a medical redshirt, he’ll have to wait until the end of next year and then apply for another year under a medical redshirt, which of course will be granted. When should we expect to know how this scholarship issue is going to shake out? What is the deadline? I disagree- impossible to say anything with certainty. But safe to say CZ is not your typical projected lottery pick. I actually think it’s very likely he stays for his Junior season (gets his degree) and then 50/50 for Sr year. no chance he stays beyond 12′-13′ season. Top 5 pick next June…. Going to need to update 2013! Woohoo! I do like how the first comment in this thread from a year ago points out how big of a shopping spree Crean would be able to go on foor 2013 and 2014 and now we are completely full. I know there always a chance for a transfer but from that 2014-2015 list Cody is the only one I feel strongly about that won’t still be there (Hollowell would be the next on the list). I think that Cody could be gone after next season but also I really do think he will be there at least 2 more years to earn his degree. The Zeller’s are very high on getting that education first before moving on and the rate that CTC has his guys working with school, they can be done after year 3. So assuming Cody stays we will be 1 over the limit again. With getting that commit from Robinson, I believe it shoots IU up to the top of BeeJay Anya’s list. If we could also land him then we are 2 players over the limit. Granted this is a good problem to have, it is still a problem. Friend of mine told me Baylor coach said Hanner P will never play a game at IU. True? I hope not, did he give a reason? I remember something where a Baylor asst coach said that if Hanner didn’t choose Baylor, the coach would do anything in his power to get Hanner deported. I’m not worrying about anything. I thought I read somewhere where scholarship numbers had to be finalized July 1st. Am I wrong in this date and if so when will we know who gets left off the team next year? There is a minor mistake on here. Although this is Creek’s 4th season, he has been red-shirted and is a red-shirt junior so he should be here for 2013-2014. Roth is Not pursuing another year. Is it official that Creek will be a redshirt Jr this sesaon ? I believe that is to be the case. Cody will still be there!!! (Hopefully) Fischer, Jurkin, HP, and JH as well. What happens if one of the studs coming in for Hoosier Hysteria commits? The class of 12/13 will be at 5 members and the program can only accept 4 LOIs. If Zeller and Oladipo enter the draft, there will be room for 5, but they can only accept 4 until a scholarship opens up… correct? What will happen for 2013-2014: Zeller goes to the NBA. That frees up one. But what COULD happen? Creek graduates (he’s eligible) and Oladipo goes to the NBA. We’ll see how it all works out now, especially with Troy’s commitment.